To me, two of the most important things when hosting an event are: 1) details, details, details & 2) carry the theme all the way through from beginning to end. This means the invitations, no pressure, better be good! I was on a tight budget this time around and enjoy doing a bit of design (blame it on my advertising background) so I opted to make my own. I cobbled together three different invitation designs, got my hands on some free fonts, threw it on some vintage brown paper and broke out my very crafty PowerPoint skills. BOOM – we had an invitation. The vintage brown paper soaked up more of the color than I had been anticipating so I layered them on another bright red card stock to add some pop. So, the guests have gotten invites, 50% of the people who will actually show up have RSVP’d and it’s party day! Now, the first thing guests will see is – well, balloons on the mailbox, duh, but aside from that – your door. Sometimes I do a banner, sometimes not but this was a CARNIVAL! 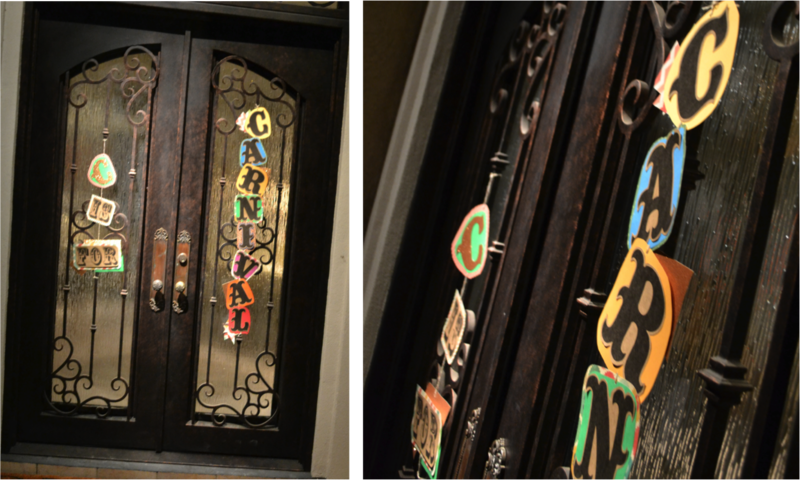 Of course the door needed to be dolled up 🙂 I used some of my free fonts (which you can find at the bottom), some colorful card stock paper and a little bit of sparkle paper I’d had left over from another event to back some of the letters. Then I just laid them out on the floor the way I wanted them, took a hole punch to the top and bottoms and strung them together with a bit of twine. Voila! Welcome to the carnival. 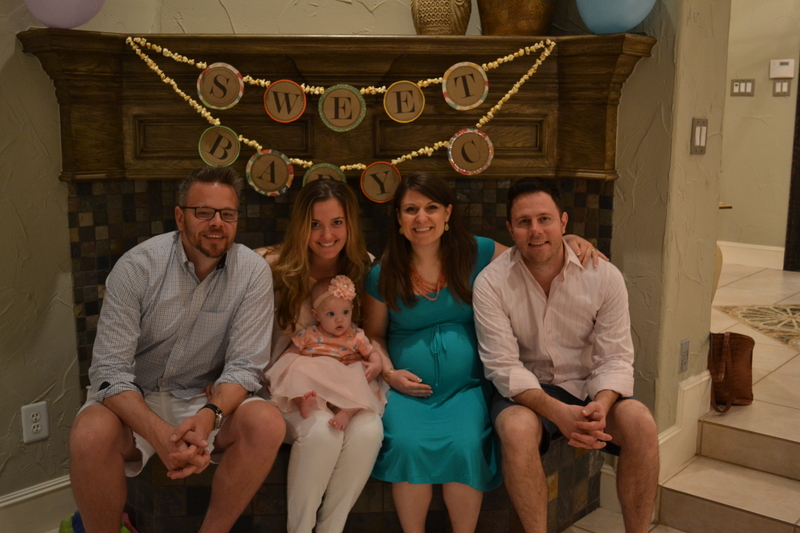 As guests entered, they were invited to sign a special book brought by the father-to-be’s mom. Getting to take home a book signed by their family & friends was just one more sweet thing we could do for these parents to be! 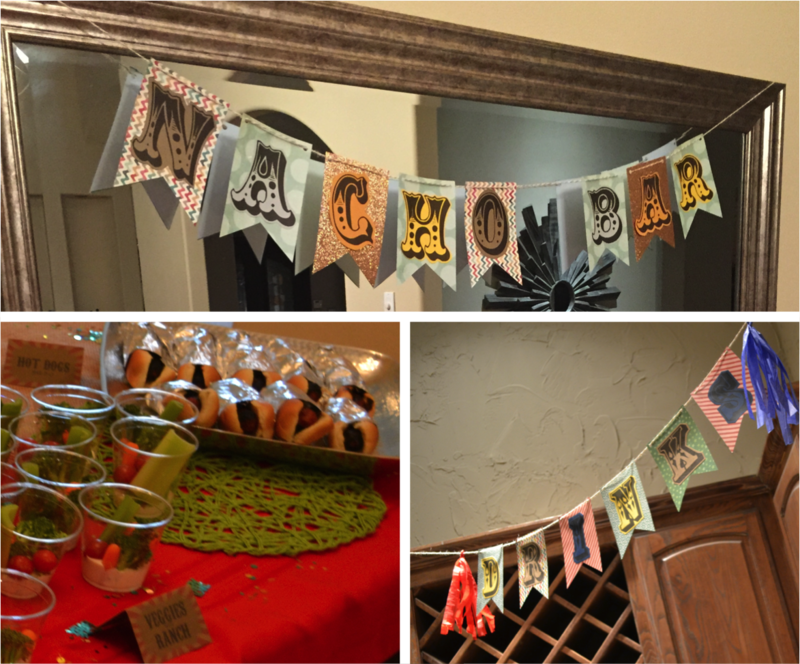 Guests then dropped their gifts off around the fireplace where I created one of my favorite signs! This one consisted of some free circle downloads, printed on the same vintage brown paper that I did the invitations and then I backed them with a few pages out of this fun pack from Michaels. To finish it off and coordinate the carnival theme in, I took some popcorn, needle & thread and strung it all together. That’s right – it’s popcorn! How fun is that? 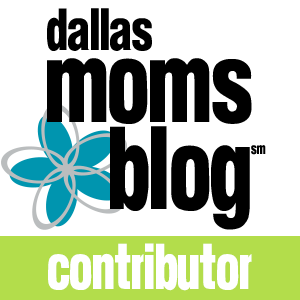 And speaking of popcorn – let’s get down to the important things…the food! The carnival theme obviously needed our staples like hot dogs & corn dogs. To make them look authentic, we just wrapped them in foil and put the condiments in the little plastic bottles you see at a fair. We also set up a whole nacho bar complete with all the toppings for guests to make their own. And of course, we threw in some veggie cups to get those greens into the diet. We also set up a whole drink station complete with three different lemonades & rubber duckies floating on top! Gotta have the Nacho Bar & Drinks banner? FREE PRINTABLES at the bottom! Now for the MOST important – the sweets 🙂 In case anyone was wondering where the carnival theme went…ya right…just take a look at this table of yummies. 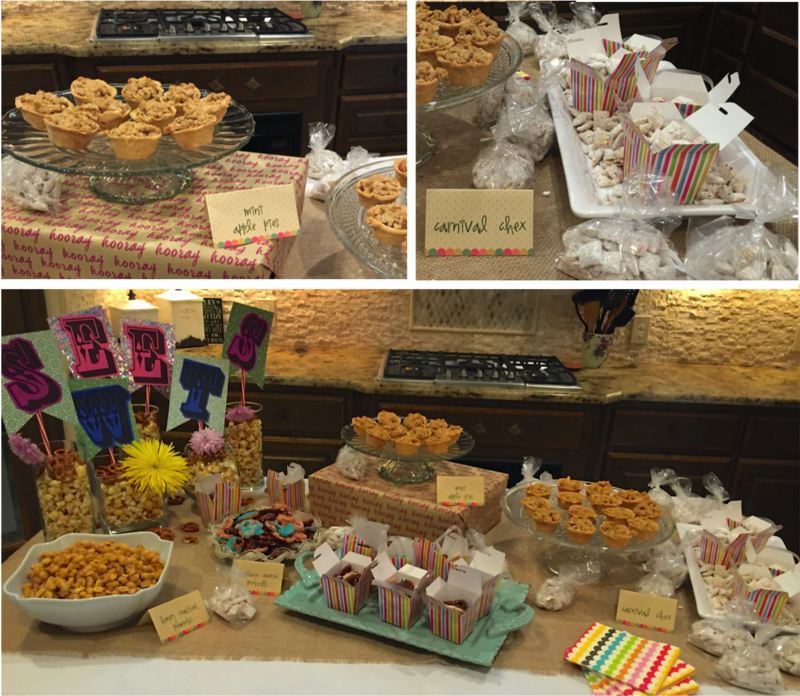 The spread included Honey Roasted Peanuts, Mini Apple Pies with Streusel Topping & Carnival Chex! All of these yummy treats can be found right here AND be sure to see the blog post on those super cute Mini Apple Pies!. 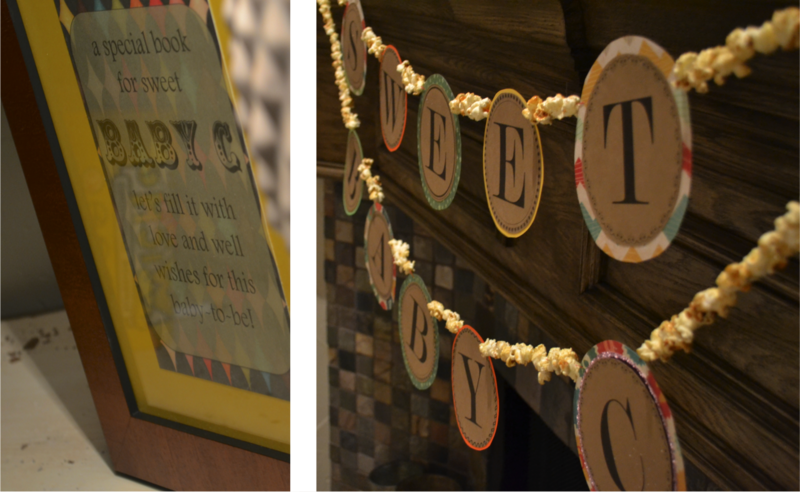 The setup included another adorbs “Sweets” sign which can be printed from link at the bottom. I taped those suckers onto some striped straws I’d had from Christmas and used a collection of vases from the dollar store and some more popcorn to secure them a bit. My Water BrokeI: before the couple started opening their gifts, we handed out ice cubes for all guests to put in their drinks. 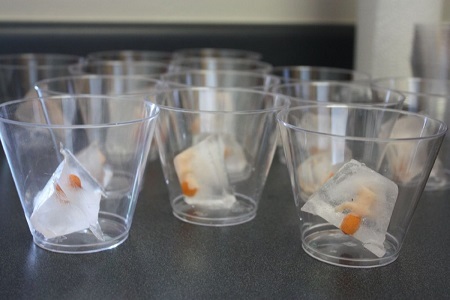 These ice cubes had tiny Mardi Gras cake babies inside of them (kind of creepy looking). The first person that noticed if their ice-cube broke and the baby was floating freely in their drink yelled out, “my water broke!” and they were the winner! 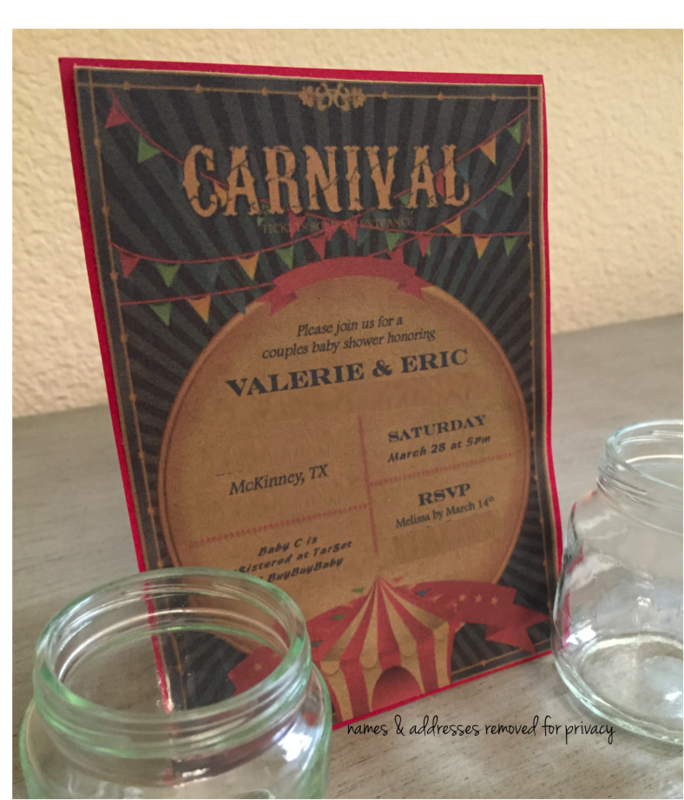 I had a blast planning & putting this mini carnival together for this sweet couple. Can’t wait to hold the newest little one. Enjoy all of the free goodies below and happy hosting! Download the free circus fonts I used here!